With extreme vehicle lifts today, the angles at the top and bottom become very severe quickly. An expensive solution is to rotate the pumpkins. The second and better solution to buy our two CV drive shaft. Why two CVs? Front axles can not be shimmed so that the pinion points up in a straight line with the drive shaft within 3 degrees which is the rule for using a CV at the transfer case. Beings that it is the u-joint that is causing the vibration due to the angle, we put two u-joints to do the job of one, and guess what, vibrations go away. So, plain an simple, a two CV drive shaft is the best alternative to paying lots of money to to have the axle turned up the hard way. to make a compound angle solution for super lifted vehicles. Do you need a flange to support Differential? Do you need a flange to support your Transfer Case? What is the transfer case? REMEMBER First, there is almost nothing that we can’t do when it comes to drive shafts. So be re-assured about our capabilities. Second, if you don’t know all the information on the transfer case or any other aspect of the technical side, don’t worry we will be contacting by email or phone and we will work with you to get all the information. 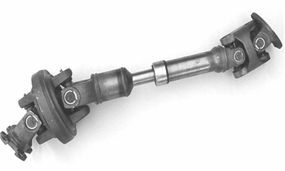 Our two CV drive shaft can have any strength CV on either end to match yours perfectly. You will need a CV style yoke or flange for the differential (not included). Ask us about that. Note: long splines are available.